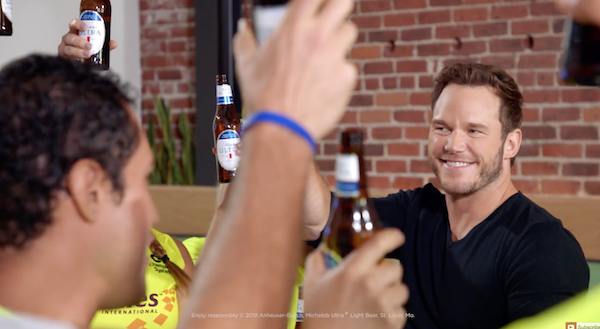 Michelob ULTRA released a new video capturing actor Chris Pratt surprising athletes from Achilles International with a chance to run the 2018 TCS New York City Marathon as part of Team ULTRA. For the second year in a row, Michelob ULTRA is bringing together 95 beer loving runners to take on the 2018 TCS NYC Marathon as part of Team ULTRA. This year however, Michelob ULTRA is excited to extend the Team ULTRA invitation to include a group of inspiring athletes from Achilles International – a non-profit organization which empowers athletes with disabilities to participate in mainstream running events. Check out the video at to see Pratt award the runners their Team ULTRA bibs and learn more about their personal journeys over a post-run beer. Consumers are also encouraged to “make this beer run count” by purchasing Michelob ULTRA to trigger a donation to Achilles International. For every case sold, the brand will donate a portion of proceeds to Achilles International. Print article This entry was posted by Art Eddy III on September 20, 2018 at 8:09 am, and is filed under Entertainment. Follow any responses to this post through RSS 2.0. Both comments and pings are currently closed.